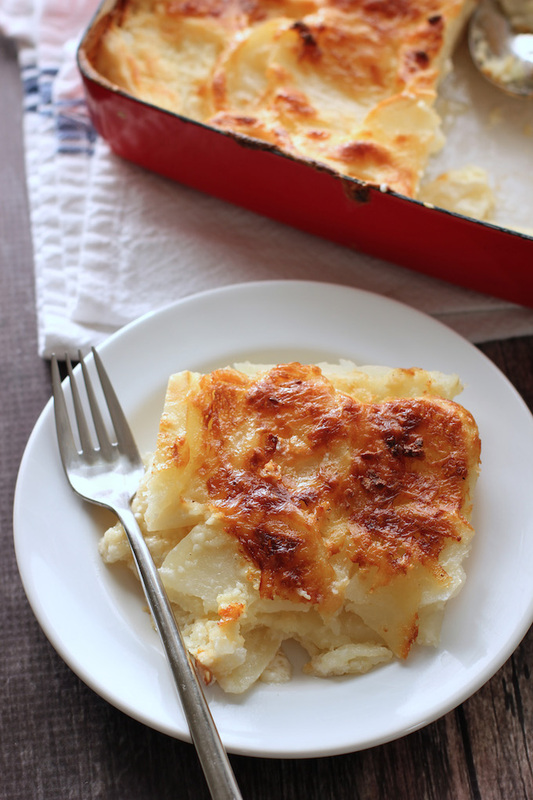 This easy, cheesy, flavorful potato gratin is a perfect side dish for the holidays. It has only 6 ingredients, takes 15 minutes to prep and makes a beautiful presentation when it comes out of the oven. Oh, and did I mention it’s just delicious. You start by slicing russet potatoes into thin, even slices and grating white cheddar cheese. Then alternate two layers of potatoes and cheese in a buttered baking pan. Next pour a little garlic infused half and half over the potato gratin. Pop it in the oven for about an hour and out comes a bubbling, cheesy potato gratin that smells incredible and tastes as good as it looks. You want to start checking the gratin around 40 minutes or so – to make sure the top isn’t getting too brown – if it’s really brown then cover loosely with a bit of tin foil. The center of my potato gratin got browner quicker then the rest of the casserole. So I just placed a piece of tin foil over the brown part so it wouldn’t burn and let the gratin continue to cook so the edges became brown as well. You’re going to mince the garlic and then add it to the half and half. This will infuse the half and half with a slight garlic flavor. When you pour the half and half onto the potato gratin make sure that the garlic scatters evenly across the top of the gratin – you don’t want a large lump of minced garlic in one area. An easy, cheesy potato gratin that is perfect as a holiday side dish or any time you want a comforting dish that looks and tastes incredible. Slice the potatoes into about 1/4 inch thick slices and set aside. Grate the white cheddar cheese on the large holes of a box grater. Measure out 2 cups of half and half and add minced garlic and black pepper. Stir to combine. Grease a 11 x 8 baking pan with butter. Layer half the potatoes into the bottom of the pan so they overlap slightly. Add a little less than half the cheese over the potatoes. Layer the second half of the potatoes over the cheese. The potatoes should overlap slightly. Layer all the remaining cheese over the potatoes. Stir the half and half and slowly pour over the potatoes and cheese. 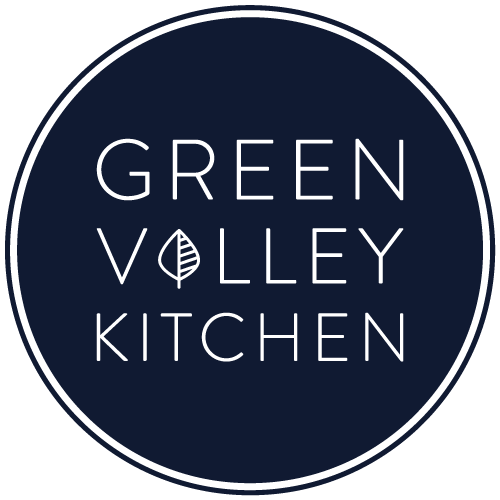 Make sure that the minced garlic – which will probably be in the bottom of the measuring cup as you pour – is even spread out over the top of the dish (so it doesn’t just land in a clump). Divide remaining butter into 6 small pieces – and dot the top of the gratin. Put the gratin in the oven for 50 minutes to 1 hour. Start checking the gratin at 40 minutes to make sure the top isn’t getting too brown. If it’s browning too much, but a loose piece of tin foil over the brown area. I take this to every “bring a dish” gathering, easy and delicious. Great to hear! This one is a crowd pleaser – everyone loves it. Hi Alyssa – That sounds great! Thanks for sharing on your site. Have a great Thanksgiving! Thanks Denise! This is my go to side dish for Thanksgiving – always a winner. Have a great weekend! 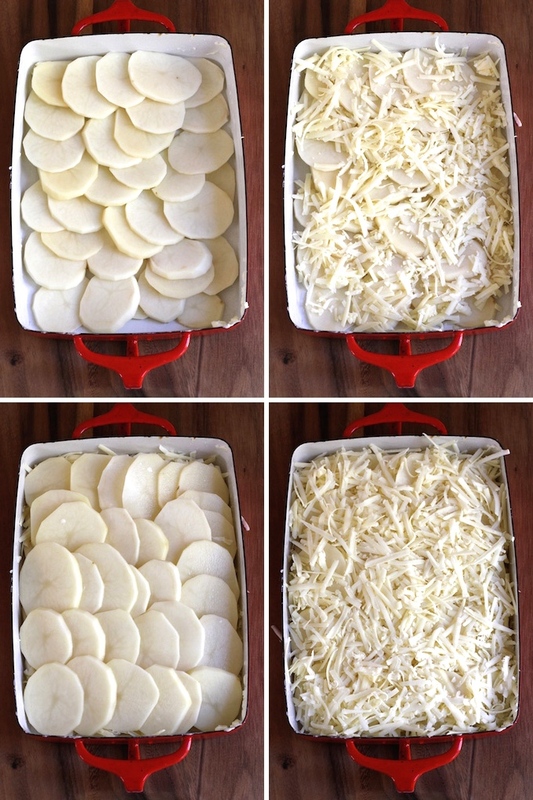 Hi Rachel – I agree, potato gratin can definitely do no wrong :). Have a good one! 6 ingredients… 15 minutes…? YES PLEASE! 🙂 This looks so good! Hi Nicole – hope you try it – it is ridiculously easy to put together and looks and tastes so good. Have a good one! This sounds amazing, and I love that you can just prep it and shove it in the oven to reveal something seriously impressive! Yum! Hi Alessandra – hope you give it a try – it’s super easy to make. Have a great night! 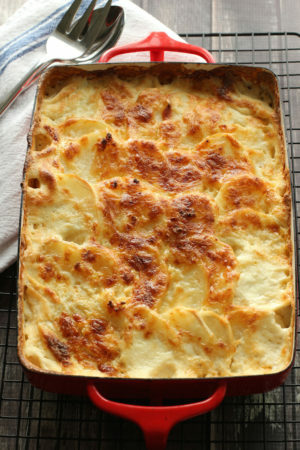 Oh my, I love the look of this gratin! Anything that is covered in cheese is always going to be eye-catching to me 🙂 I like how easy this is to make, especially for an already-busy day like Thanksgiving. Thanks for sharing, Geraldine! I feel the same way about cheese, Julia. I wish I could eat it all day. Have a good one! Potatoes and cheese are definitely a dangerous combination – but oh so good. Have a great one, Crystal! It’s comfort food season! Potatoes are one of my favorite comfort foods, any way you prepare them. But when paired with garlic and cheese and 1/2 n 1/2?! I wouldn’t be able to be left alone with this pan of potatoes! Your method of steeping the garlic in the 1/2 n 1/2 is mouthwatering. I can see how the garlic would infuse every nook and cranny! Love that last closeup… the crusty cheese with the creamy potatoes? Perfection! Thank you for this Geraldine!! Hi Traci – this is the first recipe that I had to stop in the middle of photographing and eat a piece! It smelled sooo good that I couldn’t resist. Just shows how much willpower I have around melted cheese – basically none :). Hi K – thanks for stopping by – hope you try it! Have a good one. this looks absolutely delicious! I love all carbs they are like my best friends 😉 YUM! Hi Michele – won’t it be great if we could just eat carbs all the time! But that’s what the holidays are for – to eat what you want and as much as you want :). Have a great day! Oh man…you had me at 6 ingredients and 15 minutes to prep! I can’t wait to make this! Looks scrumptious! Hi Annie – I love easy recipes and this one is so simple to put together – I also think the amount of cheese has something to do with how good it tastes :). Have a good one!